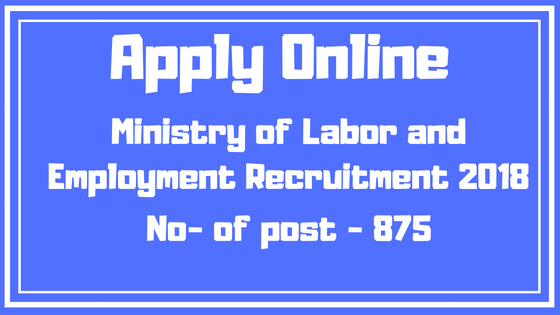 Ministry of Labor and Employment Jobs 2018- 875 Assistant, Stenographer, Multiple graduate for any degree, 12, degree, degree, BCom, 26 June 2018 Any graduation place On 21/06/2018, the Ministry of Labor and of employment announced the notification of employment to any degree, 12, BA, BSc, BCom, any postgraduate for any position of Assistant, Stenographer, Multiple. Assistant - Bachelor's degree or equivalent of a recognized university with proficiency in computer. Stenographer - 10 + 2 pass or equivalent to a recognized board. Speed ​​at 80WPM shortlength and speed up to 40WPM typewriting. Investigator - BA / B Com / B.Sc./B.BE (Bachelor of Business Economics) with statistics or mathematics or economics as one of the subjects of a recognized university / institute or equivalent. Consultent & Supervisor - Post Graduate from Recognized University/institute. Last date for submission of application: 01 July 2018.